The Power Team Puts On A Strongman Show In Ontario, Oregon! The power team consists of Christian preachers from all over and is a mix between strongman and martial arts. The four members performed feats including ice-breaking, log presses (on nails), and more! The power team consists of Christian preachers and members from all over the country. They travel around the whole world to do performances in schools and churches, displaying some amazing feats of strength. Their show is kind of a mix between strongman and martial arts. The main purpose is to motivate you in life, and of course to get you involved with God. 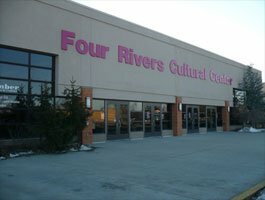 Although I don&apos;t go to church at all, I did go see one of their five shows, which was held at the "Four Rivers Cultural Center" at the TVCC Community College in Ontario, Oregon. As soon as I arrived an hour before it started, I could tell they&apos;ve been very successful, as there was a huge line, and 5 nights in a row they&apos;ve had to send people away, after letting hundreds in already. The Four Rivers Cultural Center. The four power team members that came to our area were Jonathan Caldwell, Jannet Abraham-Clark, Spencer Conley and Willie Raines. They&apos;re all of decent size, and certainly no meat-heads; they have pretty interesting backgrounds. One has played in the NFL, the other has been a SWAT member in an urban area, and another one of the members has several impressive degrees. They started off breaking tons of bricks that were piled up and leveled 6&apos; and higher. One of the members even crushed an ice wall with just his head! Being a former NFL player, Spencer also ran through 11 thick blocks of ice like it was made of glass. One Of The Members Crushed An Ice Wall With His Head. This was followed by two of the members showing some of their strength by blowing up the good old water bags like bodybuilders used to do in the &apos;70&apos;s.
By Blowing Up Water Bags. Of course tearing up a telephone book couldn&apos;t be missed, along with some pans doubled up that got bent and a license plate that they tore. Bending a 2" metal tube like it&apos;s made of rubber was also part of this event. After that was a session of breaking wooden baseball bats in all sorts of ways: under the legs, behind the back, on the knee, etc. This didn&apos;t always work, and they were talking about injuries happening during this event in the past. 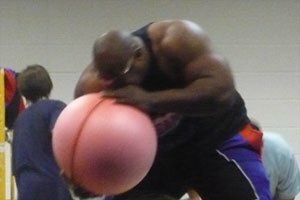 One of the events closest to powerlifting was when one of the members was laying down on a nail bed, with another member laying on him, who was log pressing over 300 lbs. Member Lays On Top Log Pressing Over 300 Lbs. With some speeches and testimonials in between to motivate the crowd, the show ended by cuffing (using real metal hand cuffs) up one of the team members and give him a minute to get out of it. Of course, he broke them easily, and within that given time. It was an awesome show, but a little too long in my opinion. That&apos;s were it kind of lost its strength. Unfortunately I didn&apos;t get a chance to interview one of the members. If the power team ever comes to your town, I would definitely recommend checking it out, as they put on quite a show. Tammo is training to be an all-around bodybuilder/strongman/powerlifter.